Autism Speaks, I Want To Say… | Jess Banks schools you. Autism Speaks, I want to say that I won’t be lighting anything up blue in April. I won’t be donating money in any of the cans shaken by earnest coeds in shopping districts. I won’t wear a single piece of puzzle jewelry. I won’t be taking part in your walks, and neither will my son. It’s too bad, really, Autism Speaks. Because my son and I are autistic, and we make fabulous spokespeople. Like many of our autistic brothers and sisters, we’re hyperlexic, so when we’re asked to speak, we do so way above our grade level. Our autism also gives us a natural enthusiasm, especially when asked to talk about the way the world looks to us, and we can describe clearly and concisely how our perceptions may differ from a neurotypical person’s. The pink hair is not, sadly, part of my autism, but it is pretty awesome and it shows very well on camera. Too bad you won’t get any pictures of me participating in your orchestrations. What I want to say to you, though, is very straightforward: I don’t need you to speak for me. I don’t need you to speak for my son. Moreover, I don’t want you to. I don’t like the messages you send. By only having neurotypical board members, organizers, and spokespeople, you say autistics can’t speak for themselves and defuse the fear and confusion about life with autism. By choosing a puzzle piece as your symbol, you suggest that autistics are incomplete or a mystery to be solved by someone else, instead of a pattern that is already intact and beautiful as it is. By devoting a paltry four percent of your annual revenue to “Family Services” (that is, grants to families of autistics who need support for therapy and adaptive technology), you fail to help autistics right here and now. The 44 percent of your revenue that goes toward research is almost solely dedicated to finding “a cure” for autism, preferably a prenatal test that would alert parents that their beautiful child will be wired differently than they expected. Your idea of a cure would solidify the public’s impression that autism is a life-ending curse. And don’t even get me started on the fact that your fundraising, advertising, and administrative salaries exceed the percentage of revenue that goes both research and family services. Instead of urging companies to “light it up blue,” why not ask them to train their employees on the nature of autism, and how best to help autistics who may be overwhelmed by the noise, light, crowds, and textures businesses use to entice neurotypical customers? Why not offer educational programs in the schools that give children the opportunity to see and question an adult autistic who thrives in their work and community? Why not raise money for respite care and better access to early intervention therapies that we know make a huge difference in the future success of autistic children? The real quest of Autism Acceptance Month must be the quest to understand the beauty, complexity, challenge, and opportunity that autism brings. So keep your change in your pocket, and lace up your walking shoes to take the autistic kids of your family, friends, or neighbors out for a walk in the beautiful April air. And most of all, let an autistic speak about autism. This may require listening very, very closely, or even reading texts or a chat program, because nonverbal autistics have important things to tell you too. Let them tell you about the flavors and textures and feelings that, while wildly overwhelming sometimes, are also rich and delightful. Let them tell you about what color the world is. Let them perseverate about their favorite things. Let them tell you how much they love you, in whatever way works for them. That’s how autism really speaks. Thank you! I didn’t know any of this stuff about Autism Speaks. Very critical info. Thanks Jessica. Very helpful information and insightful. Jessica- you said this way better than I ever could- I am going to share this far and wide so that people better understand ! Thank you! Bravo. Just. Bravo. 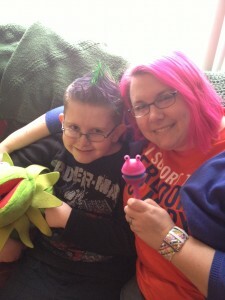 My son is autistic and I don’t EVER want Autism Speaks to speak on behalf of either of us. EVER. The above poem was written by me, a verbal Autie who uses AAC.